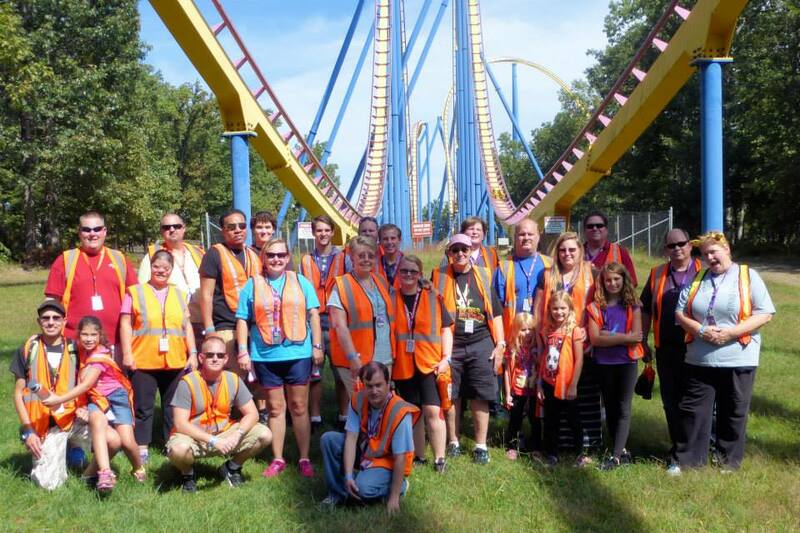 Six Flags Great Adventures roller coasters may be closed, but they are still holding events in there Safari Tour! They will be hosting a weekend long Wine Festival called Six Flags Grape Adventure. The 5th Annual Grape Adventure sponsored by Santander and Kitchen Magic features 14 wineries & vineyards, Live Music, Food and Craft Vendors. They have limited Safari Packages available for a special tasting of reserve wines at Camp Aventura in the African Plains! Last year I went to Six Flags Great Adventure in New Jersey several times with a goal of riding the Safari Off Road Adventure. I went for a trip that lasted a few days, the first of which I arrived late in the day and the Safari Ride was already closed due to capacity. I was told to get a very early start the following day because it fills up quick. So the next day we arrived when the park opened. We went straight to El Toro. After a few rides we marched off to the Safari Tour only to find it filled to capacity. It was crazy that people were going to stand in line for over 5 hours to ride. I never was able to ride in 2013. This year we went there for a day early in the season and it was open and ready for us to stand in line, but we only had one day to play and the line was 3 hours long. I was upset. This past weekend I was at the park for the Coaster Crew’s Great Adventure Online Day and they had reserved seating on the ride for the whole group. I was final going to get a chance to ride this beast. We arrived at the ride as a group and were taken up to the truck. The truck is a massive thing that is open in the back for all to see. We dispatched from the hut, and on to the very bumpy road to the safari. I only had a chance to do the drive thru safari once, and enjoyed it. The biggest issue I had is we did not know what animals we were looking at, or any information about them. That is one of the best things about the Safari Tour. They have a guide in your truck telling you all about the animals and areas. The down fall to this is you can get a good guide, or a bad guide. Our guide was amazing. He was able to steer the driver in the direction of the animals he wanted to talk to us about. He kept his mic on and answered any and all questions. He was funny, but not corny. Around the halfway point we get to stop at Camp Aventura. A small group of us got off at this point to check out the small area in the middle of this huge safari. Its fenced off from the other animals, and highlights small animals you would not see on the tour. Snakes, birds, and Ant Eater. Here we were able to do the two up charge attractions: The Soaring Eagle Zip Line, and feed the giraffes. It cost us around $12 per person with a discount to do both. We started with the giraffes because of their feeding time. They eat every 2 hours so if you don’t catch it at the right time you are out of luck. The give you some cut sweet potatoes in an ice cream cone and you get to hand feed them on a deck that overlooks the safari. It was really cool. 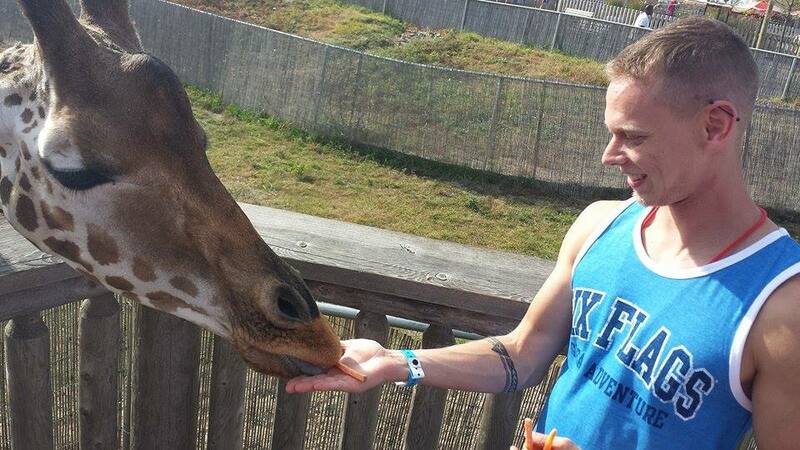 I have feed giraffes before, so I knew what to expect. After the giraffe feeding we made our way over to the Soaring Eagle Zip Line. For the past 2 years I have done this attraction at the IAAPA Expo with Stan Checketts himself. 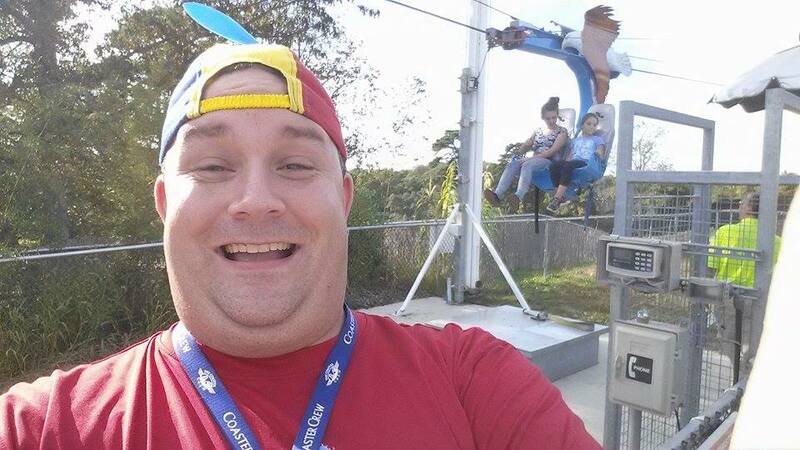 He used to be the man coming up with all the crazy ideas for S&S Worldwide, but has since moved on and is “The Man” at Soaring Eagle Zipline. They currently have over 40 ziplines world wide. This was my first one I had to pay for in the real world, but I knew what to expect. It was my girlfriend Shari’s first time, and I really wanted her to experience it. First they have to weigh the two people going on the ride. It can go up to 450lbs. We passed with flying colors, and boarded the ride. Its two seats that hang under the line and you are seat belted crossed the waist. The whole time you are on it, it feels like you are going to fall off! It pulls you backwards up to the top of the tower over the safari, and then sets you free to make your way back to the ride staging area. What an amazing ride. If you ever get a chance to try one and it’s not super expensive, you should do it. After our fun at Camp Aventura, we made our way back on to a truck with a new tour guide. This one I did not like as much. She kicked everything off great, but we did not go off the main road to find cool animals, and she turned her mic off a lot and answered questions that people had in the front row. But we were in the back and could not understand what she was saying. There was a lot of dead time where we were driving around looking at stuff but she was not talking to us. Over all I highly recommend this tour. I have done Disney’s Animal Kingdom Kilimanjaro Safaris a few times and it was okay, but they do not have the freedom to go where the animals are. They are on a track and drive that same track every time. I have also enjoyed a tour at Busch Gardens Tampa. Very cool tour where there is no path. You just drive out in to the safari and find the animals. 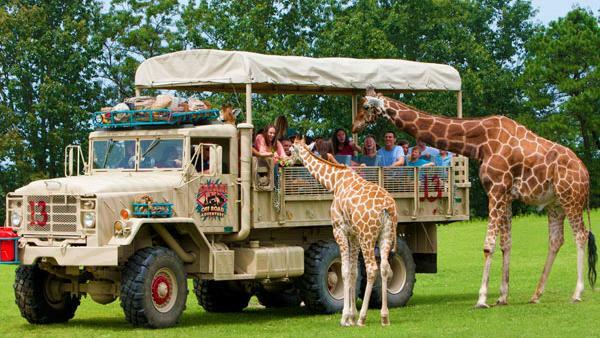 Six Flags Great Adventure has the best safari ride yet! Keep up the good work.